Weddings and party event celebration are great ways to set your party or dining tables apart using different table napkin folding techniques to impress your guest. A well-dressed table is not complete with no folded napkin skillfully embellishing each table, providing your guests a tempting touch of the cooking delights coming. Napkins need not be a boring and monotonous square of table set decor on a beautiful table. A distinctively-folded napkin will certainly bring that je ne sais quoi designed to make your guests talk about your event for several days! It takes the standard methods of the Japanese paper-folding fine art and uses it to the lowly napkin. Why fold a napkin into a regular square when it can become a lotus, swan, or simply an elf boot for your kids party celebration? 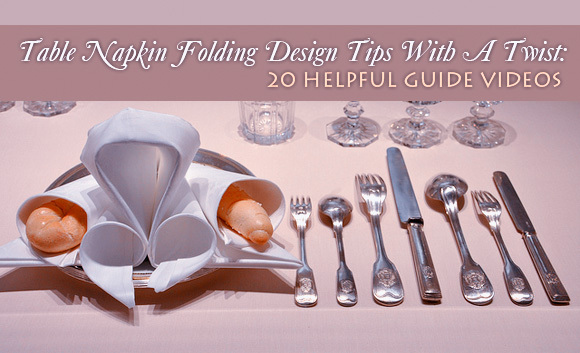 Discover more about napkin folding design ideas and techniques for your wedding or party event celebration with these 20 helpful video guides on how to fold napkins.